(In theaters, August 2005) There’s something a bit dumb about paying to see an animal documentary in the theatres when it would so much simpler to turn on the TV and channel-surf until there’s one on-screen. But March Of The Penguins‘ triumph is one of marketing as much as of content: who doesn’t love penguins? Just counting on the Linux-users segment is enough to ensure a niche audience, and once you throw in the aaaaw-inducing romantic angles of penguins walking through seventy kilometres of snow uphill both ways, well you’ve got yourself a film targeted straight at today’s family-loving Bush voter. I’m being deliberately sarcastic because it’s hard to avoid being so after the film’s syrupy anthropomorphism. Morgan Freeman may turn in his best voice-of-God impersonation as the all-knowing, infinitely kind narrator of the film, but the constant attempts at making good little sentimental humans out of animals being driven by hard-wired instincts is difficult to take seriously. One suspects that biologists in the audience are laughing themselves silly at the deliberate white-wash of penguin mores in this film, along with the sentimental mawkishness at what is, after all, cycle-of-life stuff. I ended up cheering for the sea lions at some point, just out of family-values overdose. I’d love to keep on going on this cynical tangent, but what’s keeping me from doing so is the frank admission that there’s a lot of good stuff here, including spectacular images and a mind-boggling reproductive cycle. 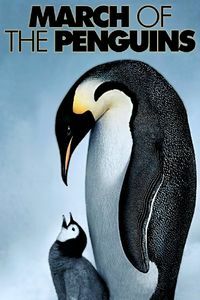 Then there’s a rumour floating around that the original French version of the film was, if possible, even more manipulative and sentimental with voice-over narration from the penguins’ point of view. Yikes. I’ll stick with Morgan Freeman’s soothing narration, and I’ll read up on the subject if I want to know the whole story.